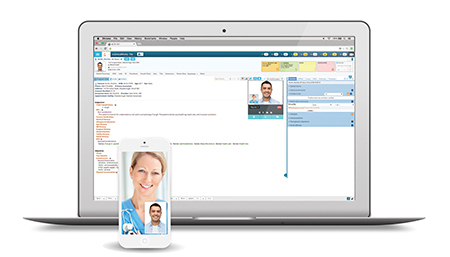 In what has become something of a grand tradition among technology vendors, eClinicalWorks announced a fresh version of its software and cloud services and bestowed a new 'e' upon its name. If one letter seems like a subtle tweak, it's not, at least according to company founder and CEO Girish Navani. "The 'e' stands for every platform, everything, everywhere," Navani said ahead of the Oct. 16 launch. "We're coming out with what will be the expectation of next-generation EHRs." To that end, Navani described eClinicalWorks 10e as a hardware-agnostic quiver of cloud-based tools including big data, home monitoring, mobile features, patient engagement, population health, social media, telehealth tools, some revenue cycle capabilities, and the ability to incorporate data from wearables. 10e, of course, also includes core EHR functionality like e-prescribing and physician notes. "I don't want to call it an electronic health record anymore," Navani said, adding that the typical EHR functionality is only about 5 percent of what 10e can be used to do. EHR makers such as Allscripts, athenahealth, Cerner, Epic, Greenway, McKesson, and NextGen are also sprouting up from the electronic health records pot. Greenway, for its part, released new population health tools this spring and followed that with a "refreshed brand" that it claims focuses "on the next chapter of healthcare" involving chronic disease management and patient-provider interaction. "Every EHR vendor is moving in that direction," said Greg Wolverton, CIO of ARcare, a non-profit network serving rural Arkansas. Geisinger Health System, in fact, revealed this week that it plans to deploy Cerner's HealtheIntent tool for population health purposes while athenahealth late last month inked a pact with Summit Medical Group and Summit Strategic Solutions to bolster care coordination and population health practices. Wolverton, a Greenway user, said the evolution of software and cloud-based services is a necessity in the switch to value-based care, population health and patient-centered models. "It helped us look at this a different way than just something we have to do but instead at how we can utilize those tools," Wolverton said. "We have to look at how we can do a better job of focusing on the health of populations globally, not just a portion that has diabetes and not manage just diabetes but also hypertension – all to organically improve overall health." Navani claimed that 10e makes eClinicalWorks among only a few national vendors to offer hardware-agnostic services. The software or service runs on Windows machines, Mac operating systems, Android, and supports HTML 5. To that end, eClinicalWorks also made the ability to view Clinical Document Architecture Data free to any customers via the Integrating the Healthcare Enterprise (IHE) standard between systems from Allscripts, Cerner, Epic, Meditech, and McKesson. And eClinicalWorks unveiled the Healow Internet of Things Cloud, which includes an API that enables third-party hardware tools to integrate with the Healow patient engagement tool. "We focused on usability, made the design flatter for minimum pops and clicks," Navani said. "We've brought everything together under one UI and interspersed that information so providers can interact with patients online."